But the really BIG news is: we are expecting a nephew! And in celebration we decided to have a baby shower. 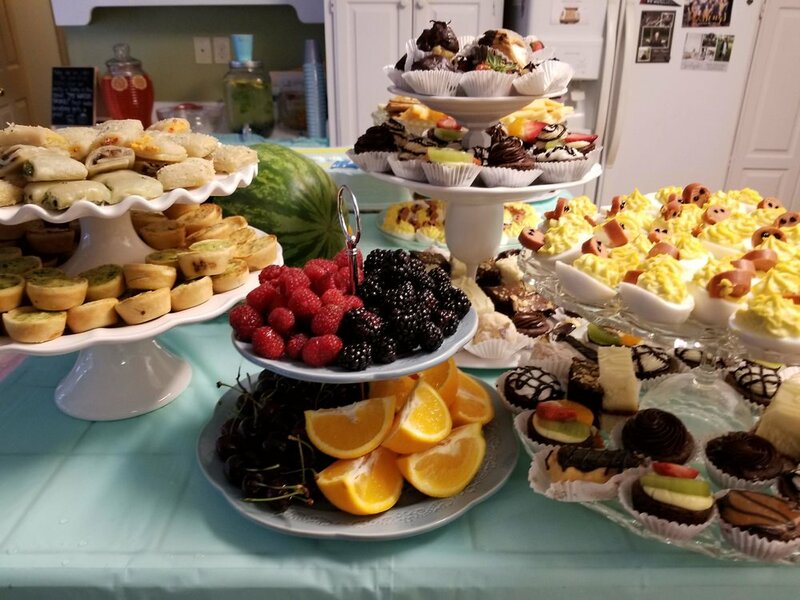 I wanted to put all our shower ideas in one post, so if any of our readers are looking to host their own baby shower you might find some inspiration here. I know this is a big change from our usual discussions of animal keeping, canning, and other homestead related topics. I will try to keep it limited to this one post, ok? The decorations. I think I might do a tutorial on how to make these little wreaths sometime. But you can purchase twig wreaths in a variety of sizes. Hot glue a few cloth flowers to your wreath and make a lovely little bow. You can change your flowers out according to the season, even use cloth leaves in autumn and fake holly berries in winter. You can add a wooden letter initial to these as well. If you want to see more examples of these wreaths and a tutorial on how to make them, leave me a comment! 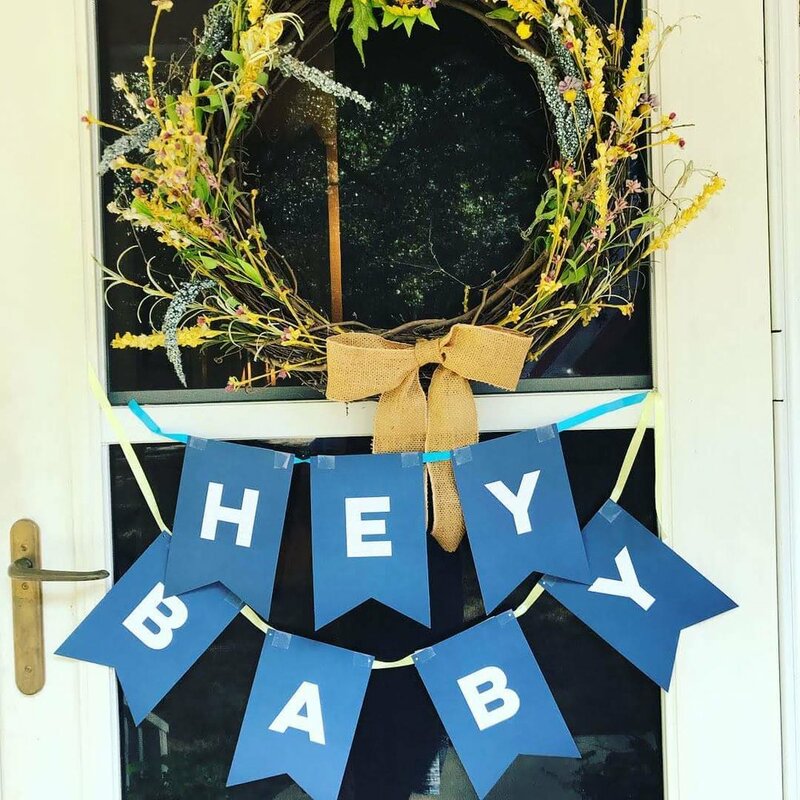 For the shower a little greeting was added with these simple flat garland letters. Banners dress up your gifts table (or gifts hearth, in this case). These simple little flag banners were used several times throughout the party. The guest book. You can buy some adorable high quality prints online these days. We got a frame that matches the nursery decor and some ink stamp pads in the theme colors, plus a few fine-tip permanent markers. Everyone left an ink impression of their thumb print signed with their name, so the little elephant looks like he's holding a bunch of balloons. We wrote "You are 'delephantly' loved" underneath after everyone had left their mark. This makes a cute little nursery decor item. The cake. We ordered this from a local bakery chain. Didn't they do a great job? 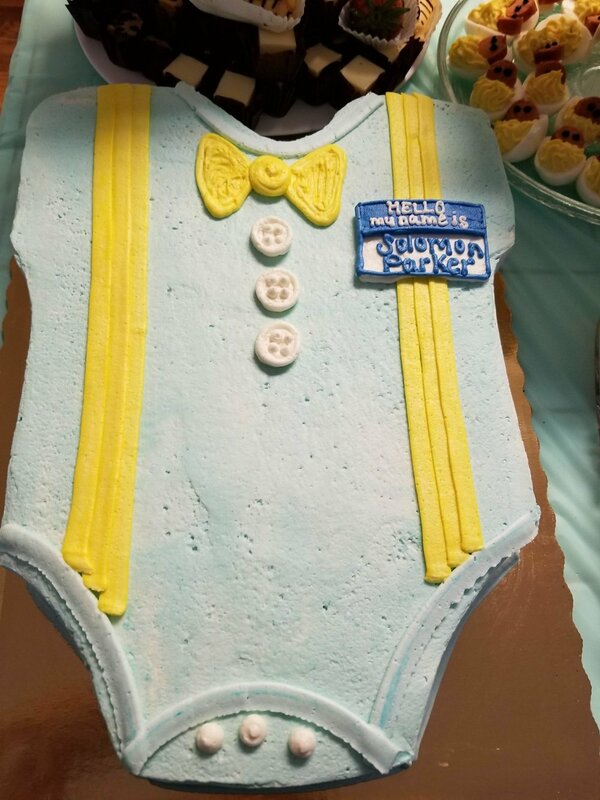 Not only was this adorable - it was delicious! The food. You'll notice my homemade serving trays here! Find out how to make your own. 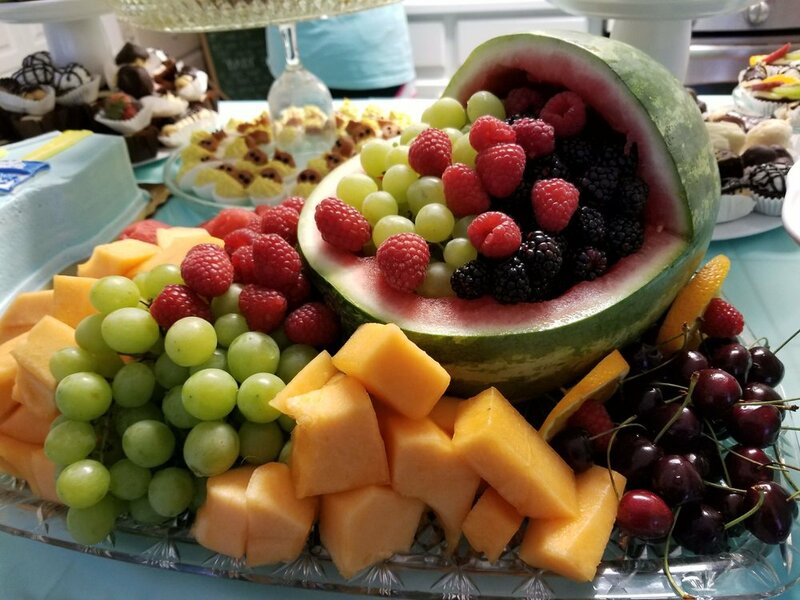 And this cute little fruit tray was so easy to put together -- cut your watermelon to look like a baby carriage by removing one quarter of it. Add slices of orange for the wheels and raspberries for the hubcaps on toothpicks. Arrange the rest of your fruit inside and around the carriage. 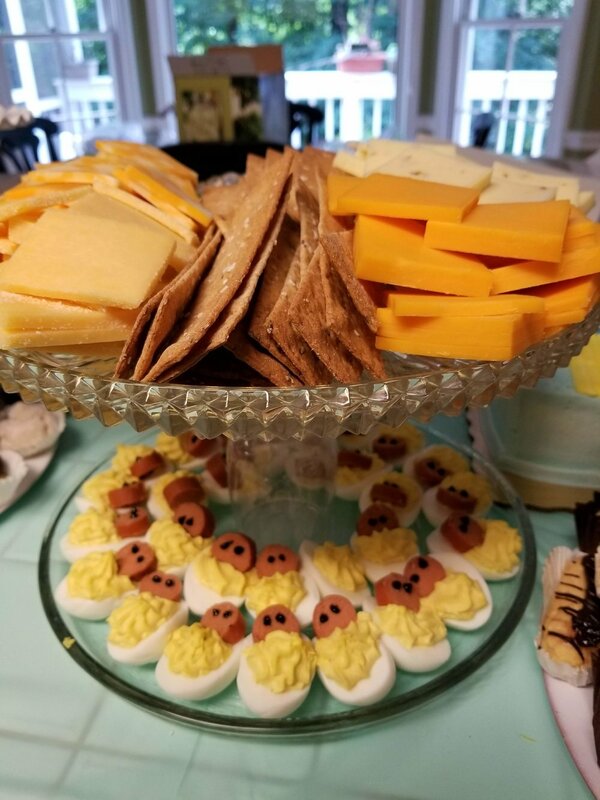 Deviled egg babies are another simple little touch. Make your deviled eggs according to your favorite recipe. Thinly slice rounds of hotdog or sausage. I use chocolate icing gel to make the two little eyes. Don't worry -- you can't taste any chocolate since it is such a small amount. Place your hotdog baby "faces" into the filling to make these cuties! The games. Baby shower games are a must. I got these adorable print outs here. This is a fun little activity for your guests to write funny or encouraging notes on diapers. This is also extremely simple to re-create: you just need markers and a pack of newborn size diapers. And here's another enjoyable little competition. Guests each wear a clip-on boy tie. 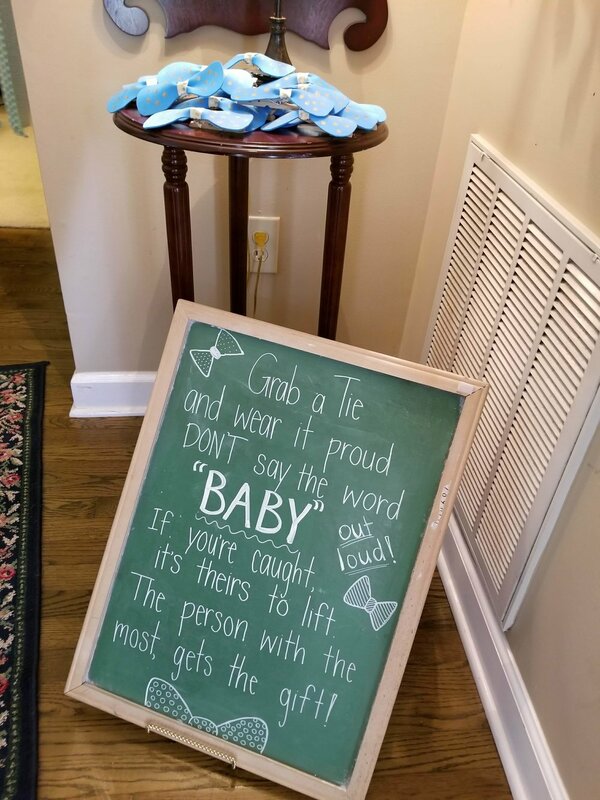 If they say "baby" their bow tie can be stolen. The winner is whoever survives the shower with the most bow ties. These little bow ties were very easy to make. I cut the basic "bow" shape from craft foam and hot glued it to a wooden clothespin. Then I hot glued on the center ribbon to make the contrasting "tie" around the bow. A few quick dots with a gold paint pen set off the entire look. And this is the blanket I made for my new nephew. Below are the boots and matching hat for him. The blanket is from a Ravelry pattern by Jody Pyott, the boots are from an old Red Heart pattern and the hat is of my own design. We are so excited to welcome this little boy into the world later this summer! What's your latest exciting news?